Samantha Nienow is the organizer of TEDxBemidji, in Minnesota, and a professional slide designer at her firm, Red Zest Design. She’s produced the decks for speakers at 14 events and this year produced her first event. Samantha says that her job is to help the speakers feel comfortable and confident. She loves presentations and takes great care in getting to know each speaker. Once she feels like she understands them, she can set about helping them tell their story visually. She got her start doing presentations by stumbling upon Nancy Duarte’s book, SLIDEOLOGY in 2009. Nancy is a TEDster and has helped hundreds of speakers on the main stage with their slides. When Sam saw the book, which suggested she could make a career out of creating presentations, she never looked back. 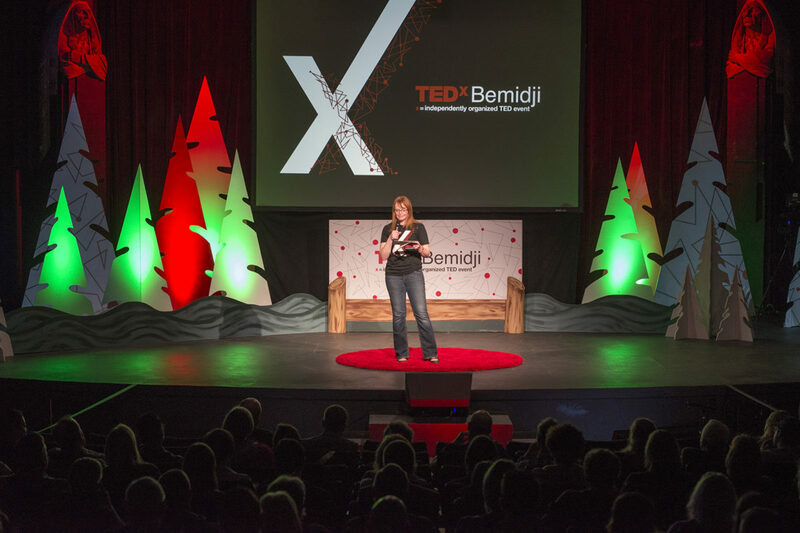 She soon realized that there was a TEDx event, TEDxFargo, only 150 miles away from Bemidji and ventured there to see how she could help. Thus begins her story. Thanks to Greg at TEDxFargo for introducing us to Samantha. Samantha created a special page on Red Zest for Hacking The Red Circle listeners with links to resources and examples she mentioned during the conversation. Thanks for the tips. She read SLIDEOLOGY in 2009 then saw the Jill Bolte Taylor and Zander TED talks. She was hooked. The first 5 or 6 she was a volunteer, doing the slides. She’s a regular at TEDxFargo now. She’s now developed a standalone design business helping TEDx organizers and other professional organizations create presentations. What makes your slides unique? Sam starts by getting to know the person behind the talk. This gives her clues to the images, textures, and styles that will best reflect the idea. She didn’t expect most successful people (speakers) to be full of self-doubt. NOTE: I hear this a lot from organizers. The high-stakes nature of the red circle is daunting. Working with what she calls, ‘pressure-prompted’ people. These are the ones that wait until the last minute to deliver materials. She’s learned how to determine if someone is like this, or an ‘early starter’. Then she knows exactly how to deal with them. Make meaningful deadlines. (Love this tip.) Also, when you are assembling your speakers’ slides, number them according to which session and which order they are in. Makes it easy to find them. Send speakers a blank black slide to start the deck. So many of them use a template or rehash an existing presentation. It makes it so much easier for the speaker and designer this way. TEDx is such a small world! Samantha was the slide designer for my first TEDx talk at TEDxGrandForks. Now we both will cross paths again as organizers!